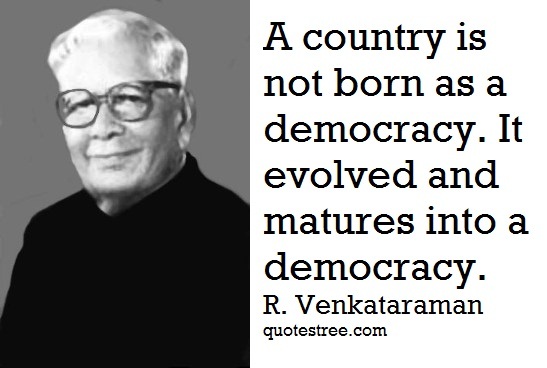 Ramaswamy Venkataraman was an Indian lawyer, Indian Independence activist and politician who served as the 8th President of India. He also served as Union Minister in Indira Gandhi's led government. Remember, under this Flag National Flag of India, there is no prince and there is no peasant, there is no rich no poor. There is no privilege; there is only duty and responsibility and sacrifice. Whether we be Hindus, Muslims, Christians, Jains, Sikhs or Zoroastrians and others, our Mother India has one undivided heart and on indivisible spirit. Men and women of reborn India, rise and salute this Flag! The people of India may be poor, many of them may be illiterate, but few societies in the world can match the Indian people in the confidence and maturity with which they exercise their democratic rights. Anyone and everyone can join politics today. The day's newspapers were on the table in front of him. All he needs to do is to show enough money towards his electability, enough vote-bank numbers on his side, and he gets a ticket. I will have to speak for my candidature versus Justice Krishna Iyer's. That in itself will be unpleasant. But more importantly when the country is plagued by so many divisions, what is the point of a future Rashtrapati, going about dividing the country's Presidential vote...? Let the electoral college decide on the basis of its knowledge of the candidates and a reading of the situation … I will keep quite. A country is not born as a democracy. It evolved and matures into a democracy. We are only in the infant stages of the democracy. All these situations will help to find a solution to meet every situation. The developing world to which we belong, above all, needs peace, because it is engaged in a historic task – the task of rectifying the imbalances created by colonialism; the task of clearing the debris of departing empires. It is, therefore, necessary to work towards a world order that is democratic and truly multilateral and based upon equity and justice. We have not yet imbibed the democratic spirit and it will take a long time before we imbibe a true democratic spirit. One thing has been proved: The Constitution as framed is inadequate to deal with situations of the kind that have risen since the framing of the Constitution. When we framed the Constitution, we adopted the British model. Therefore, the President acts as the crown. You see, Britain has no written constitution. So, there is nothing unconstitutional there. But in India we have a Constitution and any legislation even by Parliament contrary to the Constitution is void. As the Constitution now exists, the President has to follow the British precedent in many matters. Unfortunately, there is no British precedent in this matter. I am not sure whether the President is bound to act on a reaffirmation by the Cabinet if it is totally contrary to the Constitution. Because the President has given a oath that he will defend the Constitution. Therefore, if anything goes against the Constitution, he has to defend it. The welfare of the weaker sections of our society has been entrusted to the nation’s collective care by the founding fathers of our polity. Their advancement must, therefore be regarded by the nation as its privilege. There are two things to remember. If the President is asked to do something against the Constitution, the mere fact that the Cabinet has reiterated its earlier decision may not be binding on him. If it is an administrative matter, then the reaffirmation of the earlier decision by the Cabinet will, of course, be binding. But no government and no Cabinet can ask the President to do something that is unconstitutional. So, this line of distinction will have to be drawn. Unfortunately, people in office develop a rigidity or a false sense of prestige that the Government should not yield to pressure. I was no exception to it during my earlier career in charge of vital departments. Wisdom dawns when it is too late or the situation is beyond redemption. Violence and terrorism has no place in any civilized society much less in India which is home of ahimsa. The perpetration of violent acts, especially on innocent victims, therefore, causes the greatest sorrow to us. But wisdom lies: in refusing to let the acts of a few provoke us into any form of rancor or ill will between communities or regions. The people of India have a deep faith in a peaceful, democratic order. This faith of our people must be zealously protected and strengthened. The vocabulary of growth must be held in position by the grammar of financial discipline and the punctuations of a social ideology. Adult franchise is the most powerful instrument devised by man for breaking down social and economic injustice and destroying barriers of caste, creed and religion. It has given the right to the people to choose a government through the democratic process of elections.